These young men are practicing a traditional dance in which goodness overcomes negativity. 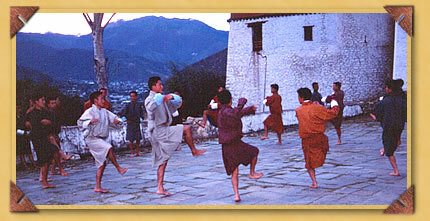 Unlike many other cultures, arts, ceremonies and festivals in Bhutan are not remnants of a bygone age. Arts, crafts, ceremonies and festivals are performed because they continue to have spiritual significance. As such, they are manifestations of a living culture. I found the Bhutanese arts are not primarily concerned with abstract concepts that may appeal to a few, but with the interpretation of values and beliefs that embody the eternal stream of life and consciousness. Bhutanese art is deeply imbued with a strong sense of morality. The Performing Arts Center will be an essential institution protecting Bhutan and its performing arts from vanishing forever. The highest forms of Bhutanese arts can be traced to Pema Lingpa, an accomplished painter, sculptor, architect and visionary of the 15th century. 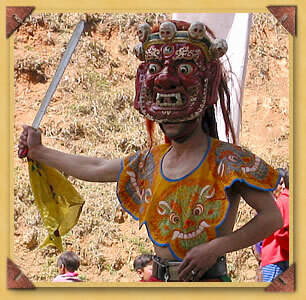 Fierce costumes such as this actually symbolize the courage and power of compassion carrying the sword of wisdom, defeating the forces of negativity. The sword represents wisdom that cuts through the root of selfishness, which is seen as the ultimate cause of suffering. The five skulls atop the mask represent our five senses which cloud the purity of our true nature. Surrounding all this seriousness are clowns who poke fun at the whole event as the audience roars with laughter, while simultaneously receiving a traditional teaching of considerable depth.